Many of the essays in this first volume of The Common Reader first appeared as book reviews, many of them in the TLS. She revised and reworked this material and added more essays specially written for this collection. She was seeking to produce a shaped text that resembled the kind of reflective conversation that might be held around a Bloomsbury dinner-table on the topic of the art of reading. I’m about to go on holiday, so intend returning to an examination of these essays in more detail when I return. As a taster, here’s her short introductory essay that acts as a foreword or preface: it explains her intentions and emphasises what seems to be the unscholarly, amateur and idiosyncratic nature of her enterprise (she tackles some of the major canonical authors, but deliberately includes many obscurities – she clearly sympathised with the obscure ones). This apparently self-deprecatory tone (highlighted by the ambivalent, gender-free use of ‘common’ in conjunction with the notion of ‘reader’) disguises her true serious artistic and personal role and agency as reader and writer, already adumbrated in the character of Rachel in The Voyage Out, her first novel, published in 1915, in which the protagonist’s choice of reading indicates a spirited and independent determination to avoid the literary choices and tastes of the male-dominated (academic) world and its authoritative canon, favouring, for example, the elemental power and wildness of Wuthering Heights over Jane Austen’s more demure depictions of the emotional life of women (there are essays on both subjects in this first volume). Here she presents her manifesto for her own canon, defending her own approach and literary philosophy and instincts, later mapped out more broadly and systematically in non-fiction works like ‘A Room of One’s Own’ and ‘Three Guineas’. Being a woman and therefore excluded from the benefits of the classical education enjoyed by males of her class, she was conscious of her ‘outsider’ status as a critic – despite being formidably well read, having access to her father Leslie Stephen’s extensive library – she too was determined to exercise the right to choose her reading and to express her views on what she’d read. Despite the ‘amateur’ tone, then, of this opening essay, she had a serious and positive aesthetic. More on this in later posts, hopefully. There is a sentence in Dr. Johnson’s Life of Gray which might well be written up in all those rooms, too humble to be called libraries, yet full of books, where the pursuit of reading is carried on by private people. “ . . . I rejoice to concur with the common reader; for by the common sense of readers, uncorrupted by literary prejudices, after all the refinements of subtilty and the dogmatism of learning, must be finally decided all claim to poetical honours.” It defines their qualities; it dignifies their aims; it bestows upon a pursuit which devours a great deal of time, and is yet apt to leave behind it nothing very substantial, the sanction of the great man’s approval. The common reader, as Dr. Johnson implies, differs from the critic and the scholar. He is worse educated, and nature has not gifted him so generously. He reads for his own pleasure rather than to impart knowledge or correct the opinions of others. Above all, he is guided by an instinct to create for himself, out of whatever odds and ends he can come by, some kind of whole — a portrait of a man, a sketch of an age, a theory of the art of writing. He never ceases, as he reads, to run up some rickety and ramshackle fabric which shall give him the temporary satisfaction of looking sufficiently like the real object to allow of affection, laughter, and argument. Hasty, inaccurate, and superficial, snatching now this poem, now that scrap of old furniture, without caring where he finds it or of what nature it may be so long as it serves his purpose and rounds his structure, his deficiencies as a critic are too obvious to be pointed out; but if he has, as Dr. Johnson maintained, some say in the final distribution of poetical honours, then, perhaps, it may be worth while to write down a few of the ideas and opinions which, insignificant in themselves, yet contribute to so mighty a result. This could almost serve as a template for those of us who attempt to write blog posts on literary topics: we acknowledge our deficiencies and the superficiality or eccentricity of our criticisms, but strive to ‘write down a few of the ideas and opinions’ – no matter how insignificant – that might just contribute to the distribution of bookish honours. Except, to my mind, ‘honours’ is too grand a term for my own enterprise. I’m content to settle for ‘ideas and opinions’, and hope that they will stimulate thought, debate – and more reading. This entry was posted in English Literature and tagged A Room of One's Own, Dr Johnson, The Voyage Out, Three Guineas, Vintage Classics, Virginia Woolf The Common Reader by Simon Lavery. Bookmark the permalink. Hi Simon, Enjoy your travels. Inspired to read this collection while you are gone and looking forwad to your additional essays very much! Such a relief from the dark days, propaganda, and double-talk going on now. I went to a demonstration at the White House last night and posted a few of my pictures on Twitter. Thanks, Maureen. I might squeeze in one more post before I leave at the weekend. Of course VW knew about dark days, too, sadly – though perhaps not the same type of darkness as the one that prevails at the moment. VW professes that she’s tiptoeing in, but this is largely a pose. She’s in a sort of dialogue with readers and writers, I’m beginning to see. Must think about this attitude of hers some more before next posts. Maybe the hesitancy was expected of her in journalism – but she still works in plenty of subversive Woolfism. Sorry to hear you’ve had bad experiences at The Millions. Was not so much the operators of The Millions, but a large crew of very obnoxious, trollish neoliberals that seemed to descent upon the website by 2015-2016. One more thing. Reminds me a bit of the approach of Anais Nin in her first published book “D. H. Lawrence – An Unprofessional Study.” It is as if both women are tip toeing in and setting expectations at a modest level as a bit of misdirection of the “powers that be.” Sadly, given some of the skuffles I’ve had with the Lit Bros at The Millions website show we still have a long way to go. I’ll look forward to more posts on these volumes. 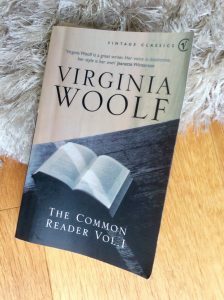 I “Had” to read them when I was doing my Iris Murdoch research – well, I just had to read the bits on the Common Reader but I ended up reading the whole lot because they were just so darn readable! Happy holidays, too! Yes, definitely our ideas and notions are what we offer and hope they can be of interest. I certainly enjoy reading yours and look forward to more thoughts on Woolf – she’s such a fascinating essayist!